Go Massif are the leading provider of airport transfers for the ski resorts of Flaine, Les Carroz, Samoens and Morillon that make up the Grand Massif region of the alps. We have been in operation for more than 12 years, are fully licensed and insured and pride ourselves on providing a reliable and efficient service. During the winter season, we provide a frequent shared shuttle service to and from Geneva airport. We also provide a private service for groups and individuals between Geneva and the Grand Massif. 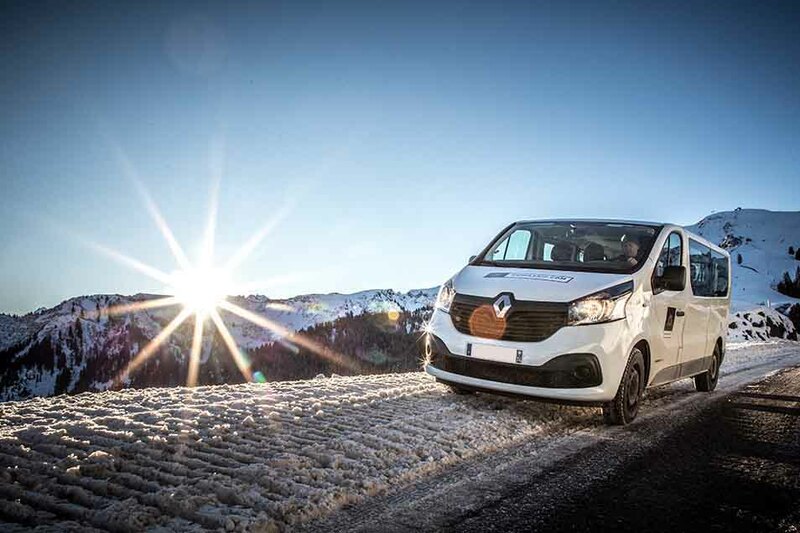 Go Massif have a fleet of 40 8-seater minibuses during the winter season, based in Samoens, Les Carroz and Flaine. All vehicles are equipped with snow tyres, snow chains and everything required to operate on snowy roads. Every vehicle has room for ski bags and the amount of luggage required for a ski holiday. Our team of professional and experienced drivers are based in-resort, allowing them to have an unrivalled knowledge of the area and back up in case of delays. Go Massif offer three types of transfer, to suit the budgets and requirements of any group size. A shared mini bus transfer service is available throughout the ski season between Geneva airport and the ski resorts of Flaine, Les Carroz, Samoens, Morillon and Sixt Fer a Cheval. Unlike the public bus, the Go Massif shared transfer service runs regularly, 7 days a week. Our vehicle will also drop you off and pick you up at the door of your accommodation. Go Massif have vehicles departing Geneva airport frequently for the Grand Massif ski resorts, 7 days a week. Shared passengers are grouped with other passengers scheduled to arrive within 60 minutes of each other on Saturdays, and 90 minutes on other days of the week. Waiting times are generally much less, as popular flights tend to land at similar times. Our objective is to get you out of the airport to resort as soon as possible! For your flight departure, you will be grouped with other passengers leaving on flights no more than 2 hours apart. We aim to get all passengers to Geneva airport at least 2 hours 15 minutes before their flight. Passengers receive a text message and email the day before their flight departure, confirming the exact time the driver will pick them up from the door of their accommodation. As the title implies, private transfers are not shared with any other passengers. The same 8-seater vehicles are used for private transfers, giving plenty of room for luggage. When arriving at Geneva airport, the vehicle is ready to depart for resort as soon as you are. For flight departures, you will be picked up at a time that gets you safely to the airport at least 2 hours 15 mins before your flight. A private transfer can also pick passengers up at hotels, train stations and any other address in Geneva.